Travel up the east side of Lake Winnebago to Meuer Farm where you'll enjoy a tractor-driven hayride along the trails while your driver explains rotational grazing, maple syrup production and land conservation. This 159-acre family-owned farm practices conservation and maintains an ever-growing agri-tainment business. From strawberries in June to sweet corn in July to a Corn Maze in September, there's always something to see and learn. A special Farm Flavors Lunch using farm fresh food items from Meuer Farm may be arranged for your group. 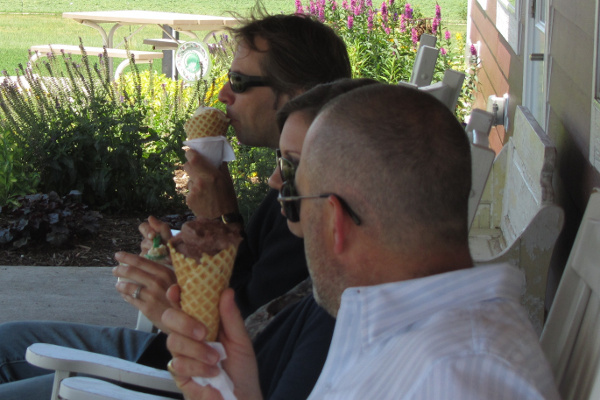 Enjoy a late afternoon treat at The Little Farmer - the oldest and largest orchard in the Lake Winnebago area. Visit the Apple House and Craft Barn and enjoy a slice of homemade apple pie and freshly made cider. At your next stop, LaClare Farms, your group will delight in viewing goat feeding and milking daily at 4:30pm. That's followed by a tour of the cheese making process and peek into the cheese aging cellars. This one-of-a-kind goat dairy and creamery offers samples of homemade goat cheese. You may also plan dinner in The Café at LaClare Farms featuring locally sourced seasonal produce. Check into one of our many fine hotels for a relaxing evening. We're happy to assist you research rates and availability. Ice cream for breakfast? Why not? Kelley Country Creamery, bestowed the Best Ice Cream in America distinction by Good Morning America, is a must-see farmstead creamery where the Kelley family turns farm-fresh milk into premium ice cream. Continue the day with a buzz - the buzz of 13 colonies of bees and the production of honey at Marshview Honey and Alpaca Farm in Waupun. This serene farm, overlooking the Horicon Marsh National Wildlife Refuge, features raw honey, honey products, yarn and raw fiber in their store. Travel to the Vines & Rushes Winery, located on a family farm in Ripon, featuring quality wines made from Wisconsin-grown grapes. Wine pairing dinners and live music held monthly, with seasonal events also scheduled. Lunch options abound - let us suggest a simple fare or a bountiful meal at one of our welcoming Wisconsin supper clubs. Complete your afternoon with a visit to the Historic Galloway House & Village. The 30-room mansion was the "farmhouse" of the Galloway family for three generations. The hand-carved woodwork, etched glass and hand-stenciled ceilings are perfect examples of the marvels of a lifestyle from a bygone era. The grounds are home to 25 historic buildings including a country church, one-room schoolhouse, a gristmill and log cabin. Return to your hotel for some R & R before heading out for your evening meal on the eastern shore of Lake Winnebago at Jim and Linda's Lakeview Supper Club, where they offer four-course meals with a backdrop of spectacular sunsets. Complete your evening with an ice cream drink - try a Brandy Alexander or a Grasshopper!